After removing and reconnecting , When I connect port e1 of IOSXRv to g0/0 of IOS 7200, I see network interface of virtual box change generic driver , UDP Tunnel. I can not ping between IOSXrv with IOS 7200.Please help me about this problem. Yes I also noticed it. And one other thing: If VirtualBox is not conected to GNS3 it does not happens. The interfaces do not change unless connected to GNS3. The "ping problem" doesn't seem to be a VirtualBox problem. I have a VM running XRv with 8 interfaces. VBoxManage modifyvm "CISCO XRv 2" --nic1 hostonly --nictype1 82545EM --cableconnected1 on --hostonlyadapter1 "VirtualBox Host-Only Ethernet Adapter"
VBoxManage modifyvm "CISCO XRv 2" --nic2 hostonly --nictype2 82545EM --cableconnected2 on --hostonlyadapter2 "VirtualBox Host-Only Ethernet Adapter"
VBoxManage modifyvm "CISCO XRv 2" --nic3 hostonly --nictype3 82545EM --cableconnected3 on --hostonlyadapter3 "VirtualBox Host-Only Ethernet Adapter"
VBoxManage modifyvm "CISCO XRv 2" --nic4 hostonly --nictype4 82545EM --cableconnected4 on --hostonlyadapter4 "VirtualBox Host-Only Ethernet Adapter"
VBoxManage modifyvm "CISCO XRv 2" --nic5 hostonly --nictype5 82545EM --cableconnected5 on --hostonlyadapter5 "VirtualBox Host-Only Ethernet Adapter"
VBoxManage modifyvm "CISCO XRv 2" --nic6 hostonly --nictype6 82545EM --cableconnected6 on --hostonlyadapter6 "VirtualBox Host-Only Ethernet Adapter"
VBoxManage modifyvm "CISCO XRv 2" --nic7 hostonly --nictype7 82545EM --cableconnected7 on --hostonlyadapter7 "VirtualBox Host-Only Ethernet Adapter"
VBoxManage modifyvm "CISCO XRv 2" --nic8 hostonly --nictype8 82545EM --cableconnected8 on --hostonlyadapter8 "VirtualBox Host-Only Ethernet Adapter"
-> CISCO XRv 2 is the name of my virtual machine. The extra 4 NICs MUST be configured in command line as there is no way to configure it in the GUI. As you can see the results are, to say the least, inconsistent. 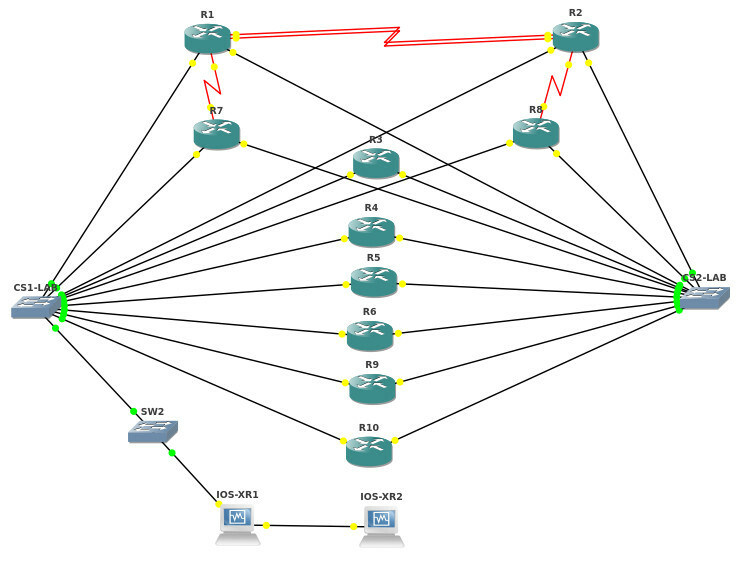 On the other hand if you ONLY start the VM outside GNS3 the results are ALWAYS equal to the first results I copied here. The conclusion I took is the GNS3 is doing something to the NICs configuration of the VM. Thank you very much. But When I cannot start VM outside GNS3, Because If I start VM outside GNS3, I cannot console this device .I can not ping beacause NIC of VM is changed .Can you use Teamviewer to this support me? Please Help me , I very thank you. Watched all the videos but still no ping between devices...Not sure what trickery was done besides removing links and re-connecting them, but it is not working. It is very easy to configure console access. You have to configure a pipes access to the serial port. XRv1 is the name I gave to this port because it is also the name of my VM. You are now ready to access the XRv virtual machine via serial port !! Also, I gave up using VBox. I'm now using VMWare workstation. I've been using XRv for about a week now very reliably, in the beginning it was hit or miss but now I've figured things out for myself. When adding the VB image within GNS3's VB Guest tab, I choose 8 Ethernet ports, and only check 'Enable console support and Start in headless mode'. The timing doesn't need to be exact, but counting things out, this is what I did. After I began pinging, I deleted the Ethernet link at about ping #2, waited about 5 - 10 seconds and then readded the Ethernet link between the e1's. 2-3 more ICMPs will fail, then you'll get a pause as if there is high latency and then the ICMP echos will come through. When I first started using the IOS-XRv last week, I would remote and immediately readd the Ethernet connection and the traffic would never pass. I've left my IOS-XRvs along with a dozen 7200s up and running for days without issue. Even the Pause/Resume GNS3 feature works really well with the IOS-XRv. I hope that helps. I was very frustrated in the beginning when I couldn't get the IOS-XRv to pass any traffic but now after a week, the ONLY abnormal things is pinging, remove, and add Ethernet to get things working when I start a lab. This seems to be a PER interface issue. ie. if you've got e1, e2 & e3 connected to other devices, you'll need to do the "extended ping, remove, add" to get things working again. I started my lab which included 2 IOS-XRv's and got distracted by life. 40 minutes later I came back and tried to just remove the IOS-XR links without running a continuous ping and traffic started passing. I removed the link between IOS-XR1 & IOS-XR2, waited 5 seconds, hooked it back up and the OSPF adjacency formed nearly immediately. I then removed the link between IOS-XR1 & SW2, counted to 5 and added it back and the IS-IS adjacency formed as well. Wait until you see the "SYSTEM CONFIGURATION COMPLETED" message from within the IOS-XRv console, then remove, count to 5 and add the link back. I think that there needs to be continuous traffic being sent over the links before and after the links are removed and added back, mine was multicast. Thanks bdk, but it still does not work for me. I will have to wait for a patch/fix...if any. For now I am using VMware workstation trial. It works fine there. When I configure a pipes access to the serial port, I already access IOSXRv.After I connected IOS 7200 to IOSXRv,but I can't ping together. Well, the "ping problem" is a normal behavior of the GNS3/VBox/XRv combination. The way to solve it is to make a continuous ping from one side of the connection and then remove the link and reconnect the link again. What I did was to virtualize XRv in VMWare workstation and connect it to GNS3 via a cloud. That way it works perfectly and has no "ping problem"
If I had time I would try to virtualize it in Hyper-V because the limit of NICs per virtual machine is 12 and VMWare solutions (whether Workstation or ESXi have a limit of 10). Can you give me skypeID? We can exchange experience together.Thank you very much!